Welcome back crafty friends! 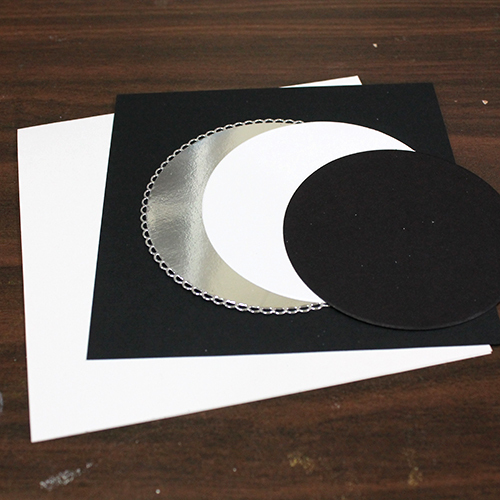 Today I have a fun little card to share that I created using 3D Foam and Foil. Here are all of the details. Crafty confession: I love simple, geometric and symmetrical design. 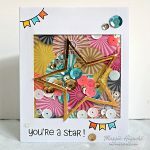 So when I saw that Scrapbook Adhesives by 3L had come out with 3D Foam Circles, I knew I wanted to create a card design using them as an embellishment rather than JUST as an adhesive. 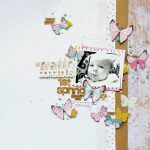 First I started by creating my cardstock card layers. The base of my card is 6×6. 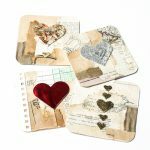 I used circle dies for the smaller layers. 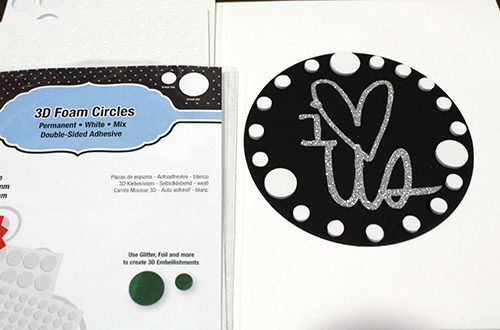 On the smallest black cardstock circle, I added the sticker sentiment in the middle and then started adding the 3D Foam Circles to create a decorative border. 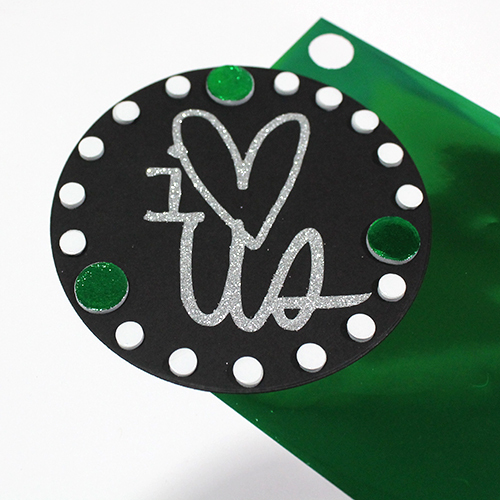 Remove the top liner from only the large 3D Foam Circles and use green foil from the 3D Foam Holiday Embellishment Kit add colour to the foam. Simply touch the foil to the adhesive – colored side up – and rub gently. Next use the E-Z Runner Ultra and Silver Creative Photo Corners, and adhere the black cardstock (5.5 x 5.5 inches) to the 6 x 6 inches card base. 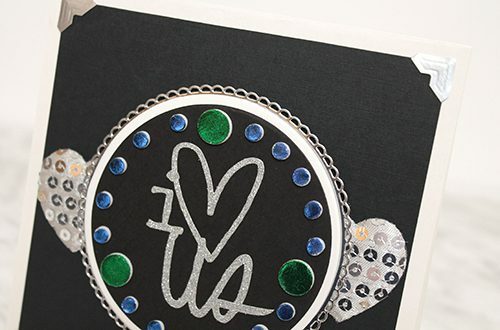 Once the silver sequined adhesive heart embellishments were added, I used 3D Foam Squares to adhere the layered circle to the card base. 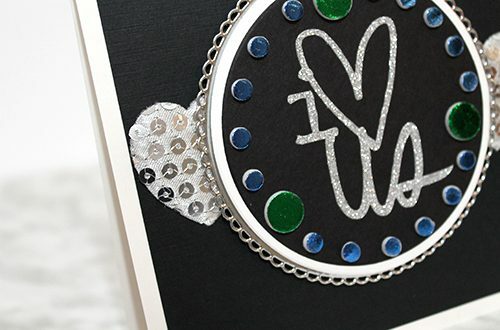 I love the sparkle and dimension that the 3D Foam Circles with foil adds to the card. They’re no longer just for hiding between the layers! Happy crafting and have a sparkly day. This entry was posted in 3D Foam Circles, 3D Foam Shapes, 3D Foam Squares, Adhesives, Cards, Crafts & Tutorials, E-Z Runner® Dispensers, Embellishments, Permanent Adhesive, Tutorial and tagged 3D Foam Circles White Mix, 3D Foam Creative Embellishment Kit with Foil, 3D Foam Squares Mix White, 3D Foam Squares Regular White, Card, Card Making, Creative Photo Corners Silver, E-Z Runner Ultra Refill, E-Z Runner Ultra Refillable, Glitter, Tutorial, Wear Your Adhesive on the Outside. Bookmark the permalink. 2 Responses to "Simple 3D Foam and Foil Card"
What a sweet little card! It’s tiny but packs a big punch. Great tutorial have a wonderfu day. This is thinking outside the box! 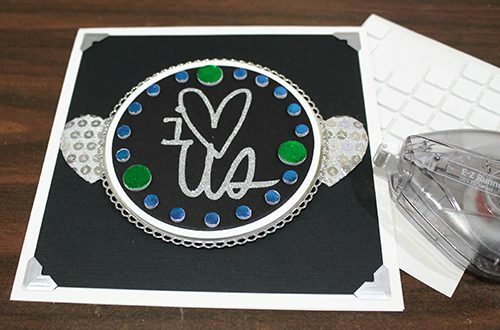 Great idea using foil on the circles!! !